If you're a woman living in New York or any major city —or in reality, anywhere in the world— you've most likely experienced street harassment. It could be catcalling, a stranger grabbing your derriere without permission or even when that self-proclaimed 'nice guy' followed you home because 'he just wanted to get to know you'. NYU Junior Sophie Sandberg understands this reality for women and wants to highlight it. 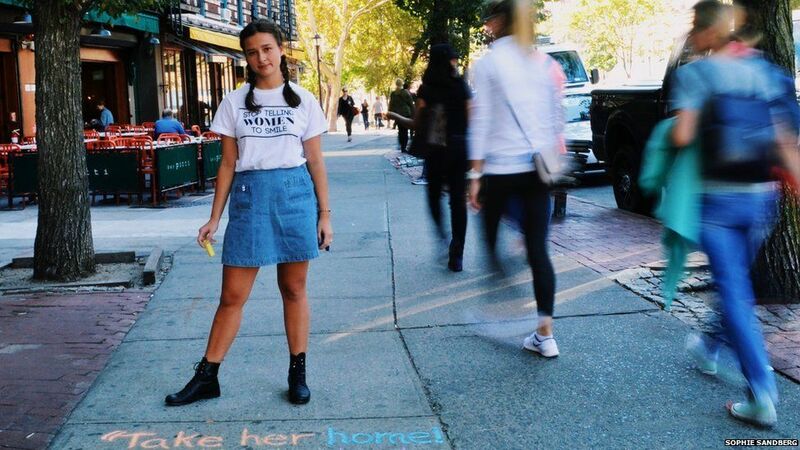 With her project "Catcalls of NYC", Sandberg uses the vulgar catcalls women have heard and turns them into art by chalking the phrases in vibrant colors on the street where the verbal harassment took place. Sandberg posts pictures of the finished product on her Instagram account, @catcallsofnyc, which boasts over 26,000 followers. "DM me your experiences of harassment and location in NYC area and I will share," the artist wrote in her bio. The Tab spoke with Sandberg to learn more about her passion project to #stopstreetharassment. Was this just something you decided to do on your own free time or was this a project for a class? It was inspired by a class project for my freshman year writing class. We were assigned to create a project and immerse ourselves in something and use social media to document it. So I'd always been interested in catcalling —or disturbed by it—so I decided to immerse myself in it. At first, I thought I was going to take pictures of men catcalling women, but then that seemed a little dangerous and scary. So I decided I could use the words that were said and record them in the spot they were said and I thought that was simple and powerful. So it started off just what was being said to you and then you expanded it? I had a lot of material from growing up in New York so I used that to start off. Then my friends knew about it and would tell me their experiences. But I would say for the past year or so I've just been using what strangers message me. When asked "when was the first time you realized you were a woman?" my friend says she knew the first time she was catcalled on the street. Do you remember the first time it happened to you? Yes, I distinctly remember being twelve and someone whispering from a car and not realizing I was being cat-called. Looking back, I'm able to realize it. But the first time I was aware of it was when I was 15-years-old. I had a job for the first time downtown and I got dressed up and that kind of made me a target for it. And I felt like there was something different about me that was realizing it. So this started as a school project which you continued after it was graded. What compelled you to keep it going? A big part of it was having people say that it was a really good idea and I think if my friends weren't so supportive I probably wouldn't have kept doing it. It was also really motivating when people started to message me and thank me for doing it. So if you're a junior now, you've been doing this for two years? It's interesting because in this moment, it feels like a very apropos thing to be doing. But at the same time, all of this has been happening for years and years. Have you found recently a greater interest in the project? I think that part of why it's blowing up right now is because people are really interested in the stories that have been silenced for some many years, and that's the reason I started it two years ago. It's always been something that has affected my friends and me and people who have dealt with harassment. But now people are realizing that there have been so many stories that've been silenced for so long and are interested in them. It's good to talk about it…I didn't talk about cat-calling with my friends when I was 15 that much. And I think continuing the conversation is what makes room for change and drawing attention to it in a bigger way. What do you think about the environment on NYU's campus? Can you walk into any space at NYU and feel comfortable? Because we're in the middle of the city…you know I've been harassed in Washington Square Park numerous times. Do you think that NYU could be doing anything to combat that behavior? What I think we need is better bystanders for people to step in. By starting a conversation about it, NYU could prompt that sort of behavior. I mean, I've definitely been harassed in the park and I have done some many people's catcalls in the park which is ironic because it's our campus. The project must take you all over the city if you chalk where people experienced catcalls then, right? Yes, it takes me all over. I am a full-time student so I tend to do the ones around campus sooner than the ones that send me to Brooklyn. It's unfortunate because it's not like they're less important, it's just harder to get there. Do you want to expand the project or recruiting people to join a team? Well right now actually there are lots of people approaching me who want to do 'Catcalls of' wherever they live, like "Catcalls of Texas." I would definitely be interested in doing because that could be a huge movement. But yes, I could use more hands in New York. Check out the project on Instagram @catcallsofnyc.